Julie L. Moore is the author of Slipping Out of Bloom (WordTech Editions) and the chapbook, Election Day (Finishing Line Press). In addition, her manuscript, Scandal of Particularity, was a finalist for the 2011 FutureCycle Press Poetry Book Prize and a semi-finalist for the 2011 Perugia Press Prize. Moore has twice been nominated for the Pushcart Prize and received the Rosine Offen Memorial Award from the Free Lunch Arts Alliance, the Janet B. McCabe Poetry Prize from Ruminate, the Judson Jerome Poetry Scholarship from the Antioch Writers’ Workshop, and the Paul Mariani Scholarship for Excellence in Poetry from Image‘s Glen Workshop. Her poetry has appeared in Alaska Quarterly Review, American Poetry Journal, Atlanta Review, CALYX, Cave Wall, Cimarron Review, The Missouri Review Online, New Madrid, The Southern Review, and Valparaiso Poetry Review. She lives in Ohio where she directs the writing center at Cedarville University. You can learn more about her work at julielmoore.com. The title’s imperative applies not just to the sounds described in the poem, but to the sound of the language itself. Moore has the music turned way, way up so it’s easy to see how lyric poetry has its roots in song. 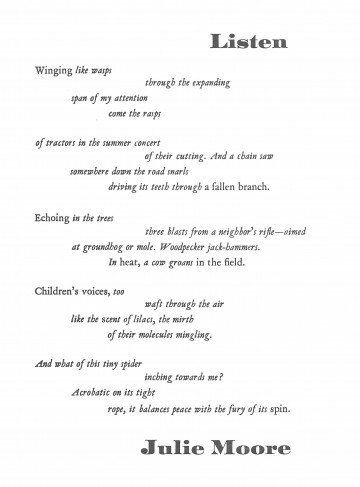 Listen to how the internal rhymes of “expanding / span” are echoed in “rasps” and “tractors”; the u in “cutting” is an unexpected echo for “of.” The repeating L sounds of “like the scent of lilacs” bleed into the m’s of “their molecules mingling,” making this a fun poem to say out loud. It will make your mouth work to say “trees / three blasts”; later in that same stanza “heat” and “field” require the same near-smile of your mouth. The title asks the reader to be quiet, to experience the world in a new, differently oriented way. It’s an implied ssssshhhhhhhh that suggested italic. Even though the case of Van Dijk italic was pretty full, the lower case h’s ran out before the poem was completely set. Devising a pattern of words in Van Dijk roman returned enough italic h’s to finish and create a poem within the poem.